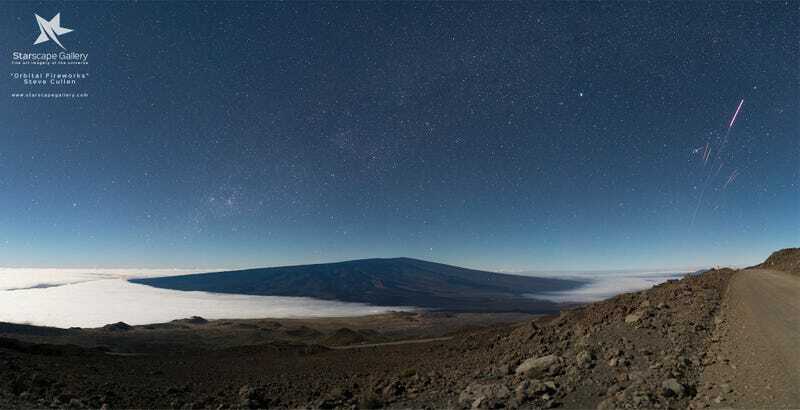 Steve Cullen from Starscape Gallery was 11,000 feet up the dormant volcano Mauna Kea taking nightscapes on Saturday when he decided to take a last pre-dawn panorama before heading home. It was a great decision, because he captured this stunning image. After a night on the Mauna Kea summit taking nightscapes and astrophotos, I started the long trek back down the mountain headed for home. 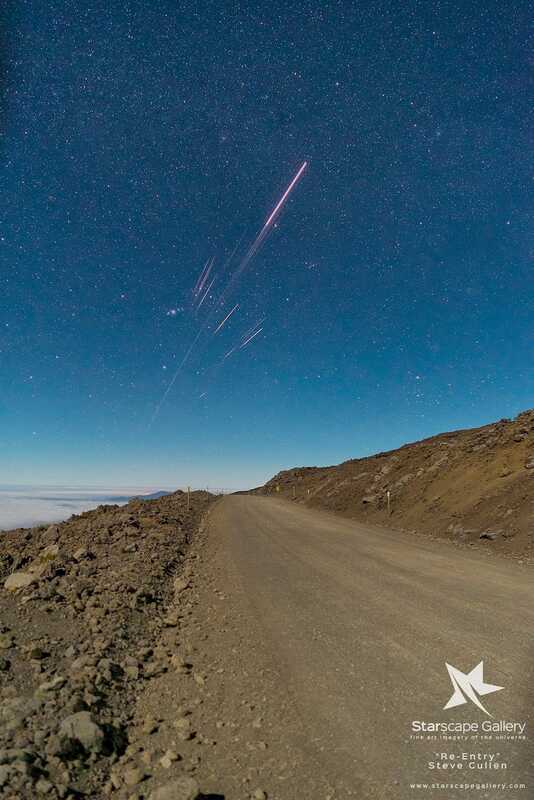 For some reason, at 11,100 feet, I got the urge to stop the car right on the narrow mountain road to take a nightscape panorama of the volcano, Mauna Loa, and the clouds blanketing the saddle. After ten or fifteen minutes I noticed a bright orange object heading directly towards me from the west. At first I thought it was a satellite but at 2am it would be highly unlikely. Luckily, I was just finishing up a panorama and my camera was already facing towards the streaking lights. It picked up the flaming debris just as it began to disintegrate in Earth’s atmosphere over the Pacific Ocean. The source of the sky show is believed to have been a Chinese rocket body. According to Bad Astronomy the flaming debris was probably the upper stage of a Long March-3B rocket, launched on September 12th 2015 carrying an unknown satellite.